(via NASCAR Wire Service) FONTANA, Calif. – Martin Truex Jr. drove three things Sunday afternoon at Auto Club Speedway. First, he drove the No. 78 Furniture Row Racing Toyota to a dominating victory in the Auto Club 400, the fifth Monster Energy NASCAR Cup Series race of the season. 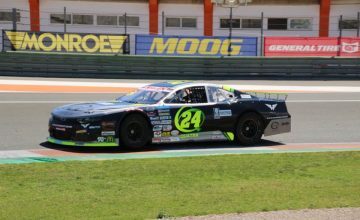 Second, he drove a time machine, turning back the clock to 2017 when his mastery of stage racing propelled him to his first series championship. Truex’s effort in Sunday’s race was every bit as overwhelming as his most convincing triumphs of last season. He started from the pole, then swept the first two stages and the victory, leading 125 of 200 laps and beating runner-up Kyle Larson to the finish line by a whopping 11.685 seconds. 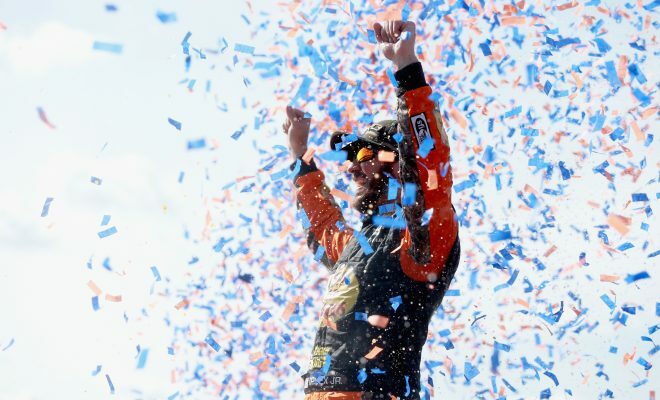 Finally, Truex drove home a point, that those who doubted he could continue the excellent performance that led to the title just might be wrong. The victory was Truex’s first at Fontana and the 16th of his career. Truex’s form, however, wasn’t the overriding question entering the race. Kevin Harvick entered the event riding a wave of three straight wins and was the heavy favorite to win a fourth, having dominated Saturday’s practices in race trim. But Harvick’s bid came to an abrupt end on Lap 38, when contact with Larson’s No. 42 Chevrolet under extremely hard racing sent Harvick’s No. 4 Ford into the outside backstretch wall, crippling the car. Larson recovered, but Harvick was consigned to a 35th-place finish, nine laps down. That left Toyota drivers Truex and Kyle Busch to battle for the lead throughout the middle portion of the race, with Truex prevailing in decisive fashion and Busch ultimately finishing third behind Larson, who fought a vibration in his Chevrolet and had to charge through the field on three occasions after precautionary pit stops. “We had a lot of weird issues, vibrations, and different stuff that happened where we had to restart at the back and drive back forward,” said Larson, who saw his streak of four straight Cup victories on 2-mile tracks end with the runner-up finish. Truex might dispute that, having picked up all seven available playoff points and taking over the series lead with a nine-point edge over Kyle Busch in second. “I knew we really had a good race car after the first adjustment of the race,” Truex said. “The thing just came alive. From there it was just about managing my tires and being smart. We had a little trouble getting beat out of the pits, and that was tough. Joey Logano (fifth Sunday) and Brad Keselowski (fourth) are third and fourth in points, respectively. Denny Hamlin, Erik Jones, Ryan Blaney, Jimmie Johnson and Austin Dillon completed the top 10 in the Auto Club 400. Harvick dropped from first to eighth in the series standings. Busch’s No. 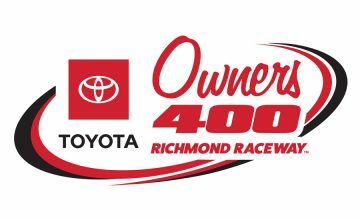 18 Joe Gibbs Racing Toyota was found to have one lug nut unsecured in post-race inspection.